How very interesting! I’ve never paid attention to who serves the tea in these dramas before. If low tea is meant to blunt the appetite before dinner, does that mean that people wanted to watch their waistlines back in the Edwardian times as well? “Those of us downstairs put the milk in first, while those upstairs put the milk in last.” LOL this is a long-lasting controversy, which is still widely debated in the UK. Anna, back in those days, luncheon consisted of light fare, or an amount of food that could fit in the palm of one’s hand. The time for dinner had been moved up to six in the evening, or even later. People became famished in the afternoon without some refreshment. In 1840, the Duchess of Bedford, to stave off weak spells, began afternoon tea with scones and light sandwiches. The custom then quickly spread. Great post, Vic–on a MOST important topic! I’m a stickler for properly made, and served, tea. Make mine strong, please. We lived in London and always found tea and accompanying food warming on a damp, cold day and an antidote to having not enough heat generally everywhere you travel around. You needed this extra meal to stay warm and never gained weight from it. In Downton Abbey, when the Countess picks up her sandwich with two hands, I found this odd and gauche. Emily Post, of course later, wrote if you must pick up food, you should use one hand only. So, what’s correct at this time period? I found the two-handed approach odd as well, but I don’t know the answer. The books I consulted did not deal with this particular point of etiquette! Do you think it was a quiet reference to her being an American?? Re the two hands, maybe if it was a cucumber sandwich it was to stop the cucumber whizzing out across the tea-table. I have several tea bowls from the 1840’s. The cups are quite small and the saucers relatively large and deep. So it does look as if pouring the tea into the saucer was intended. Pouring tea into a saucer cools it quickly. They would pour it back into the cup afterwards. No rules about one or two hands for eating a sandwich. Could be the size of the sandwich. Some were cut into very small triangles and you would only need one hand, but if larger , to avoid the contents falling out, I don’t see why not two hands. As for not putting on weight by having afternoon tea; tea doesn’t have any calories unless you put a LOT of milk in but the contents of the sandwiches were cucumber slices which are all water.The bread would give you some roughage, so healthy eating all round. Oh, butter!!! The merest smear.A walk across the room would burn the calories of that up in no time. vic, I can’t believe this is the first time i read that high tea tradition started in the us. i have read dozens of books on tea and never come across this. In Ireland they have (or had) a meal called a ‘meat tea’. This is perhaps where the ‘high tea’ comes from. I must say I never heard of ‘low tea’ before! Just a note about using the saucer to cool the tea. With hot chocolate in the 18th Century, there are engravings of ladies sipping the hot chocolate from the saucers directly. Saucers are useful for more than balancing cups. High Tea is a British institution, and refers to a tea with what we could consider “lunch” foods. Though a misnomer, High tea in the US refers to an incredibly fancy tea with cakes, pastries, cookies, jams, and jellies. In C.M. & A.N. Williamson’s Lady Betty Across the Water, the eponymous heroine travels to America and when she resides with a Midwestern farmer and his family, she anticipates the “tea” they’ve promised her, but “[w]hen they say ‘tea’ here they mean the evening meal–the last one”–which was usually around 5 o’clock. In England, upper class society just getting their second wind! High tea is not an American convention; it is English and refers to the height of the table at which it is served later in the day than afternoon tea. What is “an American convention” is inaccurately calling an afternoon tea a high tea simply because “high” sounds more “haute”! So do correct people on this every time you hear it so that we can get everyone in America straightened out on this once and for all! Tea and cucumber sandwiches.. Yummy! So glad you posted on this. I was so mesmerized by her serving tea that I missed the whole conversation! Just to muddy things a bit more, when I was a kid coming home from school I was always going home for my ,”tea.” This did not mean a cup of tea, it meant my evening meal. It took me years as I grew older to get the hang of ,”lunch,” meaning the midday meal and ,”dinner,” meaning the evening meal because, tea, to me, was the evening meal. Just to show you how ingrained that was, I feel uncomfortable and a little unsure even now calling the evening meal dinner. It still doesn’t sound or feel right to me, even though it is. Showing my working class roots here. Calling anything ‘tea’ sounds extremely fashionable to me, no matter what time of day referred to! Growing up, when we used to have a dairy, the meals (at least for the working men), were breakfast, lunch, dinner, lunch, supper. Breakfast, of course, being at about 4 am, before milking, lunch when you were done, about 9, dinner at noon, lunch again at 4 before the evening milking, and supper at about 9 again before bed. We (my husband, daughter, and I) lived in England for four years. (Loved every minute of it!) I always prefer my tea without milk or lemon (although I don’t object to lemon that much), so when I ordered tea anywhere, I always quickly added “no milk”. I sometimes received looks from the servers like they were thinking “odd American”. In fact, we lived in a small Cotswold village not far from Bampton where the town scenes of Downton Abbey are filmed. Although I sometimes missed some of the American conveniences, it was a beautiful experience I would not change for anything. I still miss it. 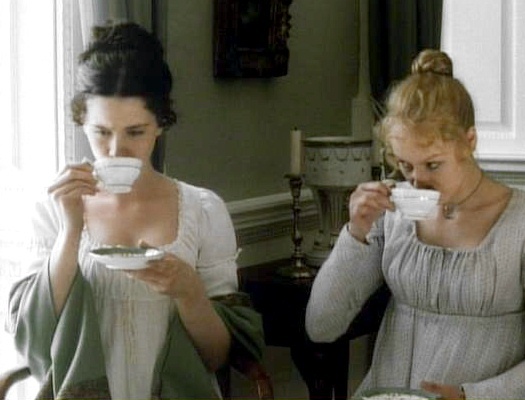 Dear Vic — In this scene of Cora and the Dowager drinking tea, I was surprised to see Cora keep on her rather large hat throughout the meeting — in stark contrast to the Dowager’s bare head. It seems to me that both of these head-fashion-statements differ from the customs in the Regency period (which you so delightfully described in other posts). Could you comment on the customs of hat etiquette in this period? In any case, I’ve always wondered how ladies (of Regency and other periods) dealt with elaborate up-dos that have to fit under a hat outdoors yet also look perfect once the hat is doffed indoors! Thank you for any light you can shed on the matter; your blog is lovely. Good question, Stephanie. A post on hat etiquette cleared up your question. While hat etiquette for men was quite detailed, it was different for women. Think about it. Those large hats were part of a woman’s coiffeur and were placed in situ with a number of pins. Imagine, if you will, a number of female visitors taking off their hats in the hallway. They would need to rearrange their hair afterward and retire to a dressing room and require the services of a maid, and the poor butler and footmen would have to find a place to stash these enormous confections. About the hat question (for afternoon tea today): The hostess might be the only lady at tea not wearing a hat. The guests are coming in from outdoors and do not need to remove their hats, but the hostess has presumably just dressed on the premises and would not have donned a hat. A most excellent post, Vic. I have been drinking tea all my life, and didn’t understand a fraction of the nuances associated with the ritual. This was fascinating! Thanks for all of the information from both sides of the pond. I serve teas in my home for my friends, low teas, according to this post. It is true that we Americans have got the wrong idea about what a high tea is. In my research I knew that it was really more of a meal but I had the fru fru idea that an Afternoon Tea, as my friends and I call it, was more about special treats. My Afternoon Tea starts with a savory item, is followed by scones, and then small pastries and sweet little treats. We think of it as a copy of a British Tea, but it sounds like it’s a bit off. Love the distinction between low table and low tea and high table and high tea. I’ll share that with all of my tea drinking friends. I’m doing one this week and will be more understated. Re “high” vs. “tea”: I went to graduate school in Scotland, and while there, lived in a sort of student hostel which offered single rooms, shared bathrooms, and 2 meals a day for the cheap price of 5 quid/week. On the weekends, we were on our own for food except for Sunday nights, when a casual “high tea” was served up buffet style for anyone who was around and hungry. “High tea” was exactly what’s been described by several others on this blog–a full meal, often with cold cuts and, if I recall correctly (it’s been 40 years! ), sometimes we’d have cold spaghetti as a treat. It was the opposite of fancy; it was more like a very casual family-only meal, where maybe still-edible leftovers from the week’s meals could be given a second chance. When we went to fancy tea rooms (only as special treats–I think there was a spot in Edinburgh called something like “Dimmock Howden” or Brown’s or Fortnum Mason in London), it was for “tea”–I don’t recall the expression “low tea” ever used. In the San Francisco Bay Area where I now live, there are thankfully lots of places to have tea. 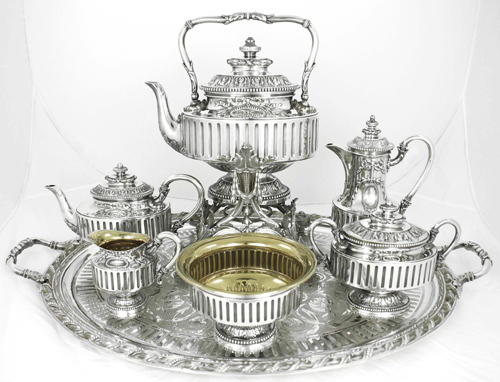 However, as noted above, the term “high tea” is often used–as someone else mentioned up-post, this probably sounds fancier but it is indeed a misnomer. Thanks for the chance to relive my past. And for giving me something to do while we wait for Season 2 of Downton Abbey, which can’t come soon enough! I enjoyed this post very much. (I apologize for commenting months after the original posting, but I’ve just come across it now.) I learned quite a bit from all the information, but I do have two minor quibbles that I’d like to note. 1. The caption to your second image, “The duchess pours boiling water over the tea leaves in the tea pot,” is not quite correct. At that exact moment in the scene, the Dowager Countess was pouring a bit of hot water into the empty tea pot in order to warm and clean it. We can be sure of this because her daughter-in-law still has both of her gloves on. By the time the Dowager Countess is actually pouring hot water onto tea leaves in the tea pot, her daughter-in-law has mostly removed her gloves (the show actually has a slight editing error here, showing more glove on that it should have). 2. I wonder if your choice of the Kizaemon tea bowl might be somewhat confusing. I have to admit that I know nothing of the history of British tea cups. 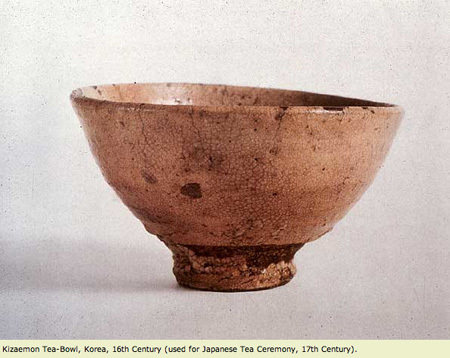 But based alone on your note of the fact that British cups took as their example Chinese teawares, I think it at least somewhat misleading to then use an image of a Korean/Japanese bowl, which would have little in common with most Chinese tea bowls. I guess your main point was to show a bowl without a handle, which certainly includes the Kizaemon bowl. However, the differences between this bowl and most Chinese tea bowls are quite great. Even if it was just to illustrate an East Asian tea bowl without a handle, I think it’d be more accurate to use an image of an actual Chinese bowl. As of writing this, I have no idea what kind of Chinese tea bowls influenced British tea cups, but I think once we have that information, it might give a clearer picture as to what the Chinese precursor to British tea cups could have looked like. Might the custom have changed over time? The practice of discarding the first cup of tea from the pot was a custom since the early Chinese tea drinkers, which the British continued. It was believed to offer a gift to the spirits. I was pleased to see the duchess follow this custom. ^^ I learned the above from “For All the Tea in China”, an excellent book about the story of how tea was smuggled from China, by a Brit named Robert Fortune working for the East India company. He brought the plants and seeds to India to become the full-fledged industry it is today. Very interesting post! 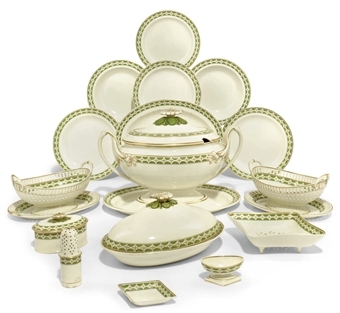 I am an avid collector of tea cups and since seeing the episode of Downton Abbey where Maggie Smith’s character pours tea, I have been longing to find this china pattern. Does anyone know who the maker of the china is and what the pattern is called? Thanks! Just want to clarify that the Dowager Countess was not discarding an entire cup as an offering to the spirits… she was merely warming up the tea pot. The proper way to prepare tea is to first pour a little hot water from the kettle into the teapot (no tea leaves at this point), swirl the water to warm the tea pot and then pour it out. After this, you add more hot water and tea leaves to prepare the tea.